Red was a star. Now she’s a target. After a failed assassination attempt on her life, Red finds herself on the run. The city has turned on her, its automated defenses in relentless pursuit. Red’s only ally now is a talking sword – the very same used to try assassinate her. Transistor is the newest game from Supergiant Games, makers of the marvelous Bastion from 2011, and is quite the departure. Where Bastion was bright and fantastical, Transistor is dark and tense – at least thematically. The artistic stylings of the studio remain in effect, presenting the unwelcoming and mysterious metropolis of Cloudbank gloriously. But the city holds many sinister secrets, and Red’s going to expose them. The demo opens with Red, clad in a fancy gold dress, presumably having just escaped an encounter with her would-be killers. Afraid and exhausted, she breathes heavily, her steps slow and steady. A few paces away, a sword calls to her – the titular Transistor. Lodged in a dead body (which I assume to be whom the sword’s voice once belonged to), it asks Red to pick it up. She complies. A sudden change of clothes later, and it’s off to figure out what the hell is going on. Those guys are small-fry, usually, but can be troublesome if there’s enough them. 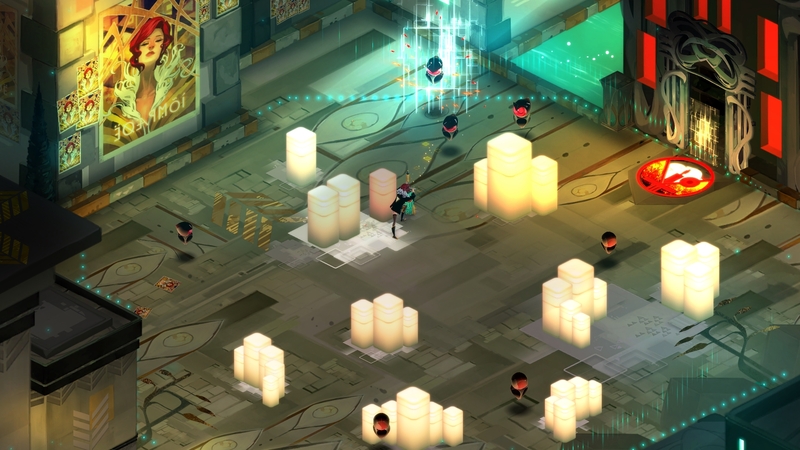 Transistor is played via an isometric perspective, a la Bastion. Red moves through the city, which is split into rooms, fighting her way through its automated defenses. Combat is a mixture of real-time and turn-based styles; actions can be executed whenever you wish, but by pressing the R2 button, time stops, allowing Red to plan her actions accordingly. She starts with only a couple moves – a quick close-range swipe and a long-range sweep of the sword – and picks up more as the demo progresses. New skills appear as the sword absorbs the essence of the recently departed. A fair number of bodies line the streets, the sword able to speak to them. Each skill corresponds to one of the face buttons, up to four able to be equipped at a time. Upon entering battle, pillars sprout as foes flood the scene. First it was small turret-esque bots, followed-up by a larger variety. Easily dispatched, but difficult when contending with crowds of them. Then the Youngladies and Jerks showed up (good to see Supergiant Games keeping strong with the fun names for foes). The former creates shadowy clones of itself and is wicked fast, the latter essentially a tank, unloading endless barrages of heavy artillery whilst slowly moving across the field. This long-range strike pierces through foes, making it an important tool in your arsenal. The game is entirely playable without using the time-freeze ability, but taking on those tougher foes benefits greatly from strategy. Attacking from behind deals double damage, for instance, a tactic only achievable through planning. Battle moves too fast to do so any other way. A bar at the top of the screen keeps the function’s use controlled, depleting with every step and command set while active. Takes a while to refill, avoiding enemy fire all you can do in the meantime. Creative Director Greg Kasavin said the combat was born out a desire to harness the drama of turn-based strategy games. To put the player on edge whilst they wait and see if their carefully laid plan plays out as expected. Because adversaries regain mobility upon execution of strategy, things rarely work out ideally. A critical blow misses, targets scatter before a perfectly lined shockwave decimates them. You can spend minutes upon minutes agonizing over every move, but maybe you’d be better off just running in and improvising. It’s quite clever. 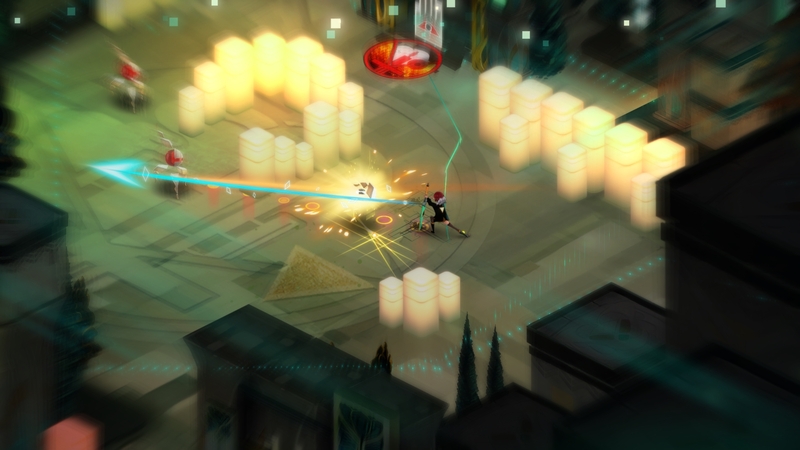 Transistor’s still many months away (early 2014 is the release window), but it’s already shaping up nicely. The game is set to launch on PC and PlayStation 4, and we’ll definitely be keeping our eyes on it for more details.